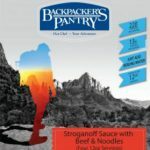 We taste-tested and ranked four dehydrated and cook-in-the-bag camping dinners. Our control groups? 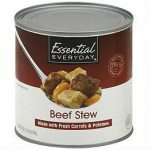 A can of store-bought beef stew… and dog food. How’d dog food stack up? See the video and results below, but let’s just say it fared much better than anyone in our office expected. Preparation: Boil 4.5 cups water, stir in contents, cover and let stand. Preparation: Boil 2.5 cups water, add to bag, stir and reseal. Preparation: Boil 2.5 cups water, add to bag, stir and reseal, let stand. Packed weight: 1 lb. 4 oz. Preparation: For the test, we heated over a camp stove. Typically, open it, close your eyes, and eat it. We prepared each meal according to the instructions on the package. The meals were lined up, assigned a number, and tasted blindly one at a time. We judged each offering according to taste, texture, smell, aftertaste, and overall satisfaction. We then rated the meals one to five stars, one being a gym sock stewed in moose drool, five being rainbow-marinated unicorn steak. In the vid below, we used a 10-point scale, but we crunched it here for simplicity. This should be called Noodles, With Some Other Stuff. Noodles don’t translate well to a quick-cooking camp meal, and this was very heavy on noodles. The texture was soft and there was no strong flavor. There was a slight stroganoff aftertaste that came with post-test burps. 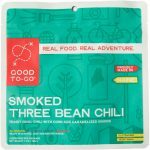 After our test, we probably would have called this “Not Bad To-Go” instead of “good.” The texture was, unfortunately, what you’d expect in a rehydrated meal: mush (maybe adding less water to the mix would be a good idea). The taste wasn’t great, but there were no weird flavors we noticed. Unbelievable. 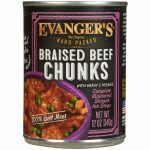 If you can get over the smell, which is very much like wet dog food, this is definitely edible in a pinch. There was more salt here than in the competition, which turned out to be a good thing. Far and away the meatiest offering on the table. No shame. Right out of the bag we were surprised. 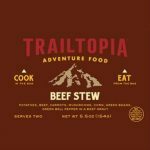 Trailtopia’s beef stew looks like anything but. The gravy is light, the meat is minimal, and there were more veggies here than the competition. This had good seasoning compared to the others, and if you close your eyes (which we did), it tastes like a simple home-cooked meal. While it didn’t merit a five-star rating, this was the most flavorful of anything we tried. It’s hearty, not-too salty, and had a good mix of lentils and meat. It was just wet enough to be a stew, but hearty enough that you wouldn’t call it a soup. Filling and tasty. 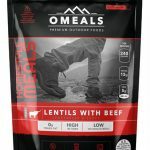 The Omeals patented heating pack not only makes it perhaps the easiest camp meal on the market to prepare, it also prevents the flavor effects of dehydrating. 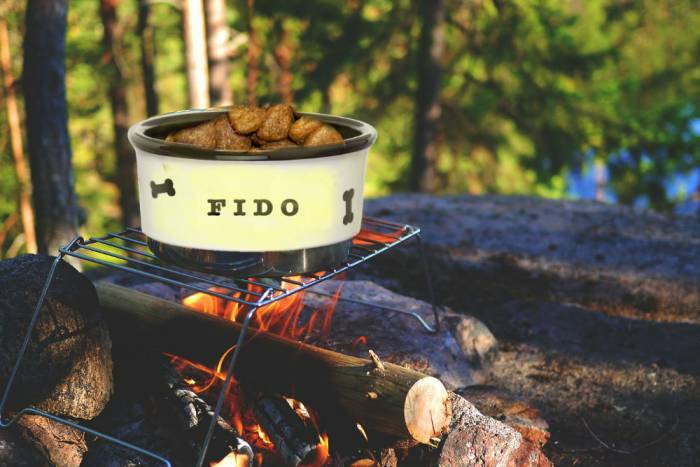 — There are dozens of options when it comes to choosing a camp-friendly meal. What are some of your favorites? Comment with your ideas and we may include it in our next taste test.